Kingdom Hearts 3D: Dream Drop Distance has been one of the biggest releases on 3DS this year, and made good use of the system's capabilities. One feature was to scan AR cards with the handheld's camera in order to recruit Spirits to your party, with two of these cards included with the game. For those that enjoyed the feature and maybe want to add a few more Spirits to proceedings, Club Nintendo UK has released a new pack with three additional cards. These three AR cards will only set you back 200 stars, and every pack is the same, so you only need one set. Have you used the AR feature in Kingdom Hearts 3D, and are you interesting in splashing some stars on extras? I wanted to be the first to comment. 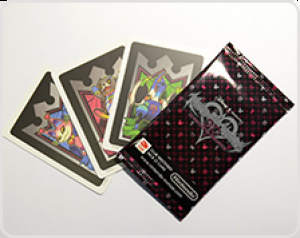 I'm not in the UK and I don't have this game, so hopefully, in the US, AR cards will come (I want Kid Icarus ones more, though). @Thomas - Kingdom Hearts includes a 2 player mode. Is there any reason it's listed as 1 player instead of 2? I doubt this cards will work on US copies will they? Please let those come out in the US. Some more Spirits would be fantastic, plus I need something to spend my Club Nintendo points on. @Aqueous Thanks, I've updated that. @Xerxes - I've played, that's why I asked. @monoxzide I know - this is why Pokemon cards will never be popular! Or any other type of trading card for that matter! People can just print them off their computer! I mean, no-one would pay to collect any sort of pieces of card! These cards were a M.O.M. exclusive bonus. I don't want to have the exclusivity ruined. I hate Club Nintendo more and more... Getting constant reminders of all the cool stuff I can't have... Why not Scandinavia and Africa?! Why can't Club Nintendo NA get AR cards? Loving this game, well up until the boss fights. Then it turns into a game of 'wtf is happening?!" I still haven't used the ones that came with the game,but I'll probably pick this up next week.